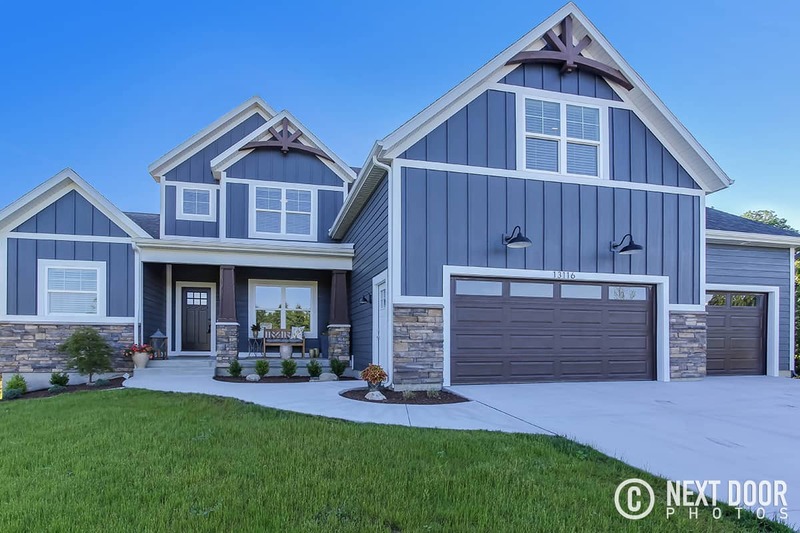 Lee Allen Homes invites you to explore this remarkable 2 story contemporary Craftsman style home located in the Copperstone development, one of Grand Havens finest communities for new single family homes. This family home features an open living concept with main level Master Suite. The two story Great Room boasts expansive windows with beautiful views to the wooded back yard and a grand fireplace ‘ship lap’ wall running from floor to 18′ ceiling. The kitchen includes a walk in pantry with custom shelving, and floor to ceiling lighted cabinets with Cambria counters and a hand-made subway tile backsplash. The luxurious Master Suite has a coffered ceiling in the Bedroom, custom designed wood shelving in the large Master Walk-In Closet, and an elegant Master Bath with ceramic tile shower, soaking tub, dual vanities and an enclosed toilet. The main level also includes a back entry Mud Room with custom built in bench for coats and shoes, an ample sized Laundry Room, a Half Bath with striking ceramic tile feature wall, and a drop zone for mail and electronics. The front Den is set up as a space of retreat, a supplementary area to read or relax. The expansive second floor houses an upstairs open Loft, three Bedrooms, a large Bath with dual vanities and an enclosed toilet/bathtub, and a Bonus Room over the Garage with two walk-in Closets. This space is designed to accommodate children and/or guests, as an added area to reside separate from the main level open concept living. The Bonus Room has many use options and could be designated as a play area for young children, a teen lounge, an executive Office, or an additional bedroom. Overall, a very family friendly floor plan with adequate space to lodge the active lifestyle of todays modern household, minutes away from the schools, downtown Grand Haven and/or Holland, and the West Michigan Lakeshore.